Move right into this stunning, impeccably maintained three bedroom home ideally located on East 77th Street and Third Avenue moments from the best shopping, schools, and conveniences of the East Side. A fabulous corner apartment with sunny city views, this is the ideally designed, flexible space you have been looking for, to enjoy for many years to come. A proper entry foyer opens to a 26 foot long living room with west views offering all day sun through its full wall of windows. The corner dining room comfortably seats eight and is open to the living area to create an inviting, seamless space for today's living. The south facing windowed kitchen offers custom, solid wood cabinetry, granite counters, dining bar, and new stainless steel appliances and a wine fridge. A full windowed, renovated guest bathroom, solid oak flooring, crown and baseboard molding and classic detail complete the public areas of this beautiful home. The split bedroom layout offers blissful comfort and privacy. The peaceful 18 foot long master bedroom suite features a pristine en-suite bathroom, meticulously renovated with white painted millwork, large stone vanity and glass front cabinetry, two custom closets including a large, walk-in, and is ideally located in its own private wing. Through the bedroom hall off the foyer, you will find two generous, sun-filled bedrooms, one 20 feet long, that is easily divided or shared to create a true fourth bedroom. A full, renovated bath, with tub, services these rooms. The piece de resistance of the bedroom wing is the spacious family/entertainment room ideal for a homework/media station, ping pong or pool table, and casual and fun, informal living. A room-sized storage room directly off this fabulous space will house your sports equipment, luggage, and is the pantry of your dreams for all of life's necessities. Each room houses its own new through wall heat and air condition unit for year-round comfort. 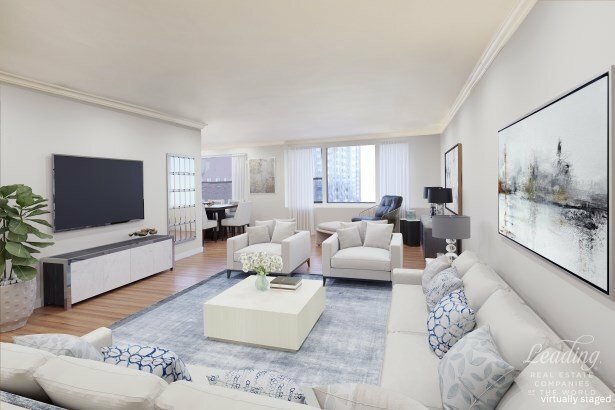 201 East 77th Street is a 90 unit, impeccably maintained and serviced co-operative at the northeast corner of Third Avenue and 77th Street and features a recently renovated and furnished common roof deck, newly renovated laundry room and bicycle room. Pets are not permitted. One block away from the 6 train and just a few short blocks to the new 2nd Avenue subway. Please note there is a monthly assessment in place in the amount of $2086.66 running through 5/2020 for overall building improvements which will be paid by Seller.